1983 - Engineering Degree from �cole Nationale Sup�rieure d�Arts et M�tiers in Paris (France). 1983 - Master of Science (DEA) in Mechanical Engineering from Paris VI University (France). 1984 - "Agregation" in Mechanical Engineering. 1989 - PhD (Doctorat) in Mechanical Engineering from University of Lyon (France). 1993 - �Habilitation � Diriger les Recherches� (HDR) from University of Lyon, France (French degree necessary to supervise PhD students and apply to a professor chair). Use of full-field measurement techniques in experimental solid mechanics (displacement, strain, temperature measurement). Development of the Virtual Fields Method, devoted to the identification of constitutive parameters from full-field measurements. Composite materials and structures: design, optimization and characterization. Co-Chairman and organizer of "Photomechanics 2006", conference held in July 2007 in Clermont-Ferrand (France) � 128 participants from 17 countries. Member of the scientific committee and/or session organizer of a number of national and international conferences. Member of the editorial board and council of the international journal �Strain� (Blackwell Publishing). Invited editor for special issues of Mecanique et Industries (Elsevier) on Full-Field Measurement methods and Identification, 2003. 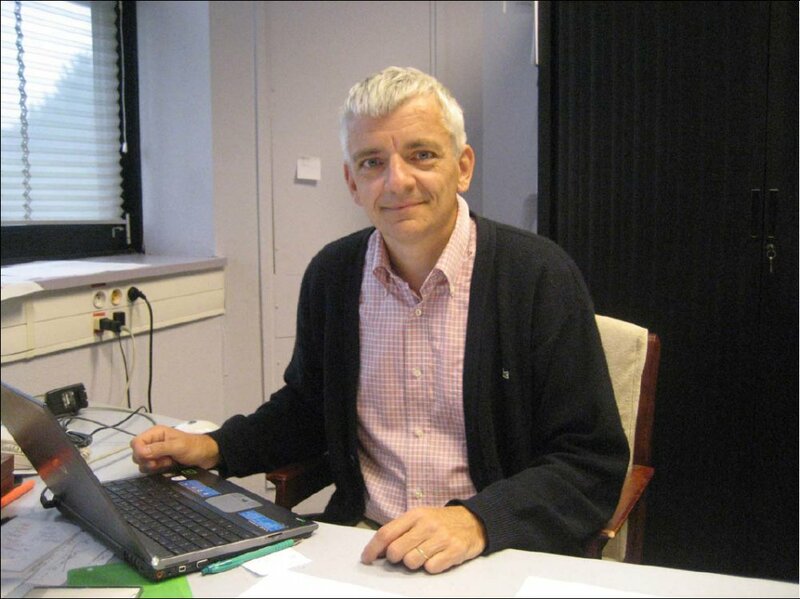 Invited editor for the Photomechanics 2006 special issue of the journal �Strain" (Blackwell Publishing). Regular reviewer for International Journal of Solids and Structures, Composites Science and Technology, Composites Part A, Optics and Lasers in Engineering (Elsevier), Experimental Mechanics (Springer). Comptes Rendus de l'Acad�mie des Sciences, , vol. 302, pp 1-5, 1989. Journal of Applied Mechanics, vol. 57, pp 964-968, 1990. Gr�diac M., Hachani A., Vautrin A.
Composites Structures, vol. 17, pp 37-49, 1991. European Journal of Mechanics/A Solids, vol. 12, n� 6, pp 819-838, 1993. Gr�diac M., Vautrin A. and Verchery G.
Journal of Applied Mechanics, vol. 60, pp 614-618, 1993. Composite Structures, vol. 24, n� 3, pp 89-98, 1993.
International Journal of Solids and Structures, vol. 30, n� 3, pp 1777-1788, 1993. Gr�diac M., Pierron F., Vautrin A.
Composites Science and Technology, vol. 51, n� 3, pp 409-417, 1994. Benkeddad A., Gr�diac M., Vautrin A. Composite Structures, vol. 30, pp 201-205, 1995. Composite Science and Technology, vol. 56, pp 841-846, 1996. Composite Science and Technology, vol. 56, pp 869-876, 1996. Experimental Mechanics, vol. 33, n�27, pp 3969-3982, 1996. Gr�diac M., Paris P. A. Journal of Sound and Vibration, vol. 195, n� 3, pp 401-415, 1996. Applied Optics, vol. 36, pp 4823-4829, 1997.
International Journal for Numerical Methods in Engineering, vol. 41, pp 293-309, 1998. Gr�diac M., Fournier N., Paris P.A., Surrel Y. Journal of Sound and Vibration, vol. 210, n� 5, pp 645-659, 1998. Surrel Y., Fournier N., Gr�diac M. Paris P.A. Experimental Mechanics, vol. 39, n� 1, pp 66-70, 1999. Gr�diac M., Pierron F., Surrel Y. Experimental Mechanics, vol. 39, n� 2, pp 142-149, 1999. Journal of Composite Materials, vol. 33, n� 20, pp 1939-1965, 1999. Journal of Composite Materials, vol. 33, n� 21, pp 2017-2040, 1999. Journal of Composite Materials, vol. 34, n� 12, pp 1028-1054, 2000. Journal of Composite Materials, vol. 34, n� 19, pp 1665-1693, 2000. Composites Part A: Applied Science and Manufacturing, vol. 31, n� 4, pp 309-318, 2000. Pierron F., Zhavoronok S., Gr�diac M.
International Journal of Solids and Structures, vol. 37, n� 32, pp 4437-4453, 2000. Dufort L., Gr�diac M. and Surrel Y. Composite Structures, vol. 51, pp 37-47, 2001. Composite Structures, vol. 51, pp 245-255, 2001. Dufort L., Drapier S., Gr�diac M.
Composite Structures, vol. 52, pp 233-246, 2001. Gr�diac M., Auslender F., Pierron F.
Composites Part A, vol. 32, n� 12, pp. 1713-1725, 2001. Experimental Mechanics, vol. 42, n� 2, pp. 186-193, 2002. Sierra-Ruiz V., Destrebecq J.F., Gr�diac M.
Composite Structures, vol. 55, pp. 445-454, 2002. Gr�diac M., Toussaint E., Pierron F.
International Journal of Solids and Structures, vol. 39, n� 10, pp. 2691-2705, 2002.
International Journal of Solids and Structures, vol. 39, n� 10, pp. 2707-2730, 2002.
International Journal of Solids and Structures, vol. 40, n� 10, pp. 2401-2419, 2003. Racana N., Gr�diac M., Gourv�s R.
Geotextiles and Geomembranes, vol. 21, n� 5, pp. 265-337, 2004.
omposites Part A, vol. 35, pp. 751-761, 2004.
International Journal for Numerical Methods in Engineering, vol. 59, n� 10, pp. 1287-1312, 2004. Chalal H., Meraghni F., Pierron F., Gr�diac M.
Composites Part A, vol. 35, n� 7-8, pp. 841-848, 2004. Muller M., Toussaint E., Destrebecq J.F. and Gr�diac M.
Composites Part A, vol. 35, n� 7-8, pp. 885-893, 2004. Gr�diac M., Alzina A., Marquis D.
Journal of Composite Materials, vol. 38, n� 16, pp. 1401-1423, 2004. Experimental Techniques, vol. 28, n� 4, pp. 23-26, 2004. Avril S., Gr�diac M., Pierron F.
Computational Mechanics, vol. 34, n� 6, pp. 439-452, 2004. Toussaint E., Gr�diac M., Pierron F.
International Journal of Mechanical Sciences, vol. 48, n� 3, pp. 256-264, 2006. Toussaint E., Destrebecq J.F., Gr�diac M.
Cement and Concrete Composites, vol. 27, n� 6, pp. 399-411, 2005. Mathias J.D., Balandraud X., Gr�diac M.
Computers and Structures, vol. 84, pp. 823--834, 2006. Composites Part A, vol. 37, n�2, pp. 602-627, 2006.
International Journal of Plasticity, vol. 22, pp. 602-627, 2006. Mathias J.D., Gr�diac M. and Balandraud X. International Journal of Solids and Structures, vol. 43, pp. 6921-6947, 2006. Archives of Civil Engineering, vol. 52, n�2, 2006. Gr�diac M., Pierron F., Avril S., Toussaint E.
Strain: an International Journal for Experimental Mechanics, vol. 42, pp. 233-253, 2006. Destrebecq J.F., Gr�diac M., Sierra-Ruiz V.
Composites Science and Technology, vol. 67, pp. 3-4, 2006. Muller M., Toussaint E., Destrebecq J.F., Gr�diac M.
Composites Part B, vol. 38, n�4, pp. 417-428, 2007. Kim J.-H., Pierron F., Gr�diac M., Wisnom M.
Strain: an International Journal for Experimental Mechanics, vol. 43, pp. 138-144, 2007. Mathias J.D., Gr�diac M., Balandraud X.
Paluch B., Gr�diac M., Faye A.
Pastor M.L., Balandraud X., Gr�diac M., Robert J.L.